After 18 years of tortuous negotiations, Russia looks set to join the WTO by yearend, marking a triumph for global trade liberalisation. WTO Director-General Pascal Lamy, who pulled off the deal with Georgia, shares a joke with Russian President Dmitry Medvedev. medications to be sold locally, saysVladimir Shipkov, executive director of the Association of International Pharmaceutical Manufacturers. Russia will significantly increase its commitments to multinational insurance providers. 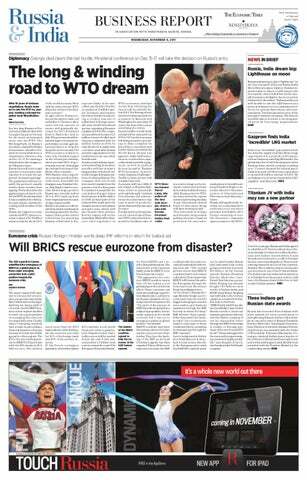 It will allow 100% foreign ownership of nonlife insurance companies upon accession to the WTO. out. In mid-October, Russia had indicated that it was going to lend the eurozone $10 billion. At the Cannes summit, Russian President Dmitry Medvedev reaffirmed that this was a possibility. Beijing has already bought 100 billion euros worth of Italian debts and EFSF head Klaus Regling has held talks in the Chinese capital on a further $100 billion loan to the Fund. “BRICS aid to the EU is a distinct possibility”,says Andrei Mordavchenkov, financial markets operations director with the Partner company. It can be channelled either through the IMF in the shape of credits, or through purchase of the much-touted EU bonds.”“Financial support for the eurozone by major emerging markets is highly probable,” says Bogdan Zvarich, chief analyst with NetTrader company. The network of main gas pipelines in Russia’s East SIberia and Far East is still under construction. of gas per year, with gas reserves estimated to last for more than a century. This will permit us to not only provide supplies to Europe, China, South Korea and Japan, but also encourage socio-economic development in our country,” says Yazev. “By 2030, Europe will be consuming around 600 billion cubic metres of gas per year. It is our main market. We have contracts running through the 2040s.” To honour all its contracts, Russia needs to supply gas in all directions and plans to boost gas output to 1 trillion cubic metres per year by 2030. Gazprom wants at least $350. The final decision has been postponed until the end of the year. On August 5, Gazprom and South Korea’s Kogas approved the roadmap that could mean a pipeline laid across North Korea to South Korea. The first phase of the pipeline will have a capacity of 6 billion cubic metres. Later on, it's capacity will be expanded to 30 billion cubic metres – enough to sell gas to both Koreas. For now, however, while pipeline contracts with large consumers in the Far East have not yet been signed, Moscow has room to manoeuvre, say experts. “In terms of transport costs, it is very convenient to supply gas to Europe from Western Siberia, and to Southeast Asia from Eastern Siberia,” says Dmitry Aleksandrov, head of the research department at the investment company Univer Capital. While the network of main pipelines in Russia’s Far East is still under construction, there is no direct route for supplying gas from Eastern Siberia to the European part of Russia and Europe. The two gas transit systems will , however, be linked soon. The net result: Russian gas producers will be free to choose between export directions: the gas can either be sent to any European country or, with a liquefaction plant in the Far East, to any country in the world. Or it could even possibly be pumped through pipelines to either of the Koreas or China. In this case, whether or not any particular country wants to buy Russian gas will cease to be of crucial importance. As Dmitry Aleksandrov says, everything will be determined by free market prices. CORAL-MED's general director B.P. Singh (inset) plans to build a factory in Russia with two large Indian companies. 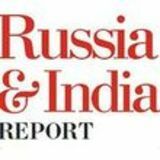 infrastructure on the Russian soil to get a bigger market share in Russia, says media reports quoting Devendra Chaudhry, joint secretary in India’s ministry of chemicals and fertilizers. Singh, who has won many awards in golf and badminton competitions as a member of Russian amateur teams, is upbeat about his business plans. Singh’s company CORAL-MED plans to build a factory in Russia in collaboration with two large Indian companies in the framework of Putin’s Pharma 2020 programme. The companies in question are Panacea Biotech and Lupin Ltd. According to Dr. Singh, the companies are covering all the costs and offering their technologies of production. The only thing that is needed from the Russian side is to support their initiative and land for the factory, which is not far from Moscow and not very expensive. Big Indian companies find it easier to forge tie-ups with Indian companies in Russia as they know the ropes and are familiar with the Russian mindset, which proves very helpful while producing and distributing medicines in the Russian market. helicopter. One is not sure that India will get the latest version of the Apache, but the previous model is also a good purchase. There is one more important reason. The approach of India’s Armed Forces to procuring combat equipment is one of diversification. This approach does have its drawbacks, but then India won’t be held hostage to the interests of one government. Currently, 70–80% of India’s military equipment is Soviet or Russian-made. The complicated processes taking place in Russia’s military-industrial complex, the delays and the quality of the products delivered also influence the selection process. But this doesn’t mean that New Delhi should abandon Moscow, a tried-and-tested partner in military-technical cooperation. Russia has many advantages. First of all, Russia has been doing this for over fifty years, with successes far outweighing the failures. Secondly, Russia has never used its arms supply, the sale of licences and manufacturing to local enterprises, or upgrades as leverage against India in political matters.This, however, is something that Washington does on a regular basis. Looking ahead, India has signed a contract with Rosboronexport for the supply of 80 Mi-17 military transport helicopters. Besides, India is holding two more tenders for the supply of 12 heavy transport helicopters and 197 general-purpose light helicopters. The total value of the tenders is $2.5 billion.The contract to deliver heavy transport helicopters will go to either the Russian Mi-26T2 or the American CH-47F Chinook, while the contract for the light helicopters will go to either the Ka-226T or the Eurocopter AS550. Russian vehicles stand a high chance of winning these tenders. The Mi-26T, for example, can carry upto 20 tonnes of cargo, while the Chinook can carry just 13.5 tonnes in the fuselage or 14.5 tonnes in external store.The Russian Ka226T light helicopter is also a superb vehicle, notable for its unique modular ability to change function at a moment’s notice. In Moscow, there’s no doubt that New Delhi will make the right choice. Skolkovo: Fast track to the future Russia is rapidly building an Innovation City near Moscow, a prized new home for investors, scientists and researchers. A 600-hectare business park under construction has five clusters: biotechnology, energy, IT, space and nuclear technology. Skolkovo has invested 4.7 billion roubles in 40 startups. 250 companies to set up shop. Pacts signed with Boeing, Intel, Cisco, Nokia, IBM, GE and Siemens for setting up research network. A picture of radiation dosimeter, a unique invention. the event of exposure to a critical dose, the DO-RA will also alert its holder with voice, sound, text, and light signals. 3. A map: A real-time radiation map of a given territory, site, or reservoir is superimposed on a downloadable world map on a smart phone screen. The device owners can supplement this map with their own GPS/GLONASS measurements using their smart phones. 4. A Personal Office. In this mode, a cell/smart phone can receive relevant and up-todate information on potential risks for the body and different organs associated with the absorbed radiation levels as recorded in the personal dosimeter. Users or their doctors can access the Personal Office data from anywhere in the world. scientific and technical projects. Most Russian inventors are far from rich, while people with money don’t like to risk their capital. Hence the main problem of Russia’s inventors: a lack of funds to promote their inventions. My advice for Russian inventors is to fight for grants to develop their inventions from places like Skolkovo. nowned institutions will be invited to deliver lectures. Will Skolkovo, a brainchild of President Dmitry Medvedev, survive the change in the regime? Political scientist Nikolai Zlobin dubs the innovation city as Medvedev’s personal ambition and doubts that the project will be of any consequence to Vladimir Putin, who will almost definitely be the next president. Naumov disagrees and feels the project is above personal idiosyncrasies of politicians. “The project’s future does not hinge on any possible reshuffles within the government,” he says. Vladimir Yelin has invented a radiation dosimeter that can be integrated with mobile devices. He speaks about key features of this unrivalled invention. Vladimir Elin: born in 1957, graduated from the Moscow High Technical College after N.E.Bauman (1984). PhD in Technical Science. In 1995-2007: Founder and President of the corporation «United International Network of Custom Warehouses» LLC. Since 2007, Chairman of the Board of Directors of "Smart Logistic Group" CJSC. Since 2011, DO-RA Project Manager and Investor. the Americans. But the Russian scientists wanted their invention to remain in Russia’s hands. The company applied to and became a member of the Skolkovo Foundation. This doesn’t mean that the devices will be produced in the City of Innovations since there will be no manufacturing base there at all. But the company may obtain a grant and legal assistance with the necessary documentation, while venture funds will find an investor in the production of“leaflets of life”. Another project being developed by a Skolkovo participant may revolutionise cancer treatment. A drug has been developed that carry anti-cancer drugs directly to the nuclei of target cells that need to be destroyed. In order to get the drug to the market, expensive clinical trials are needed in addition to regulatory approvals.The developers of the drug applied for a $500,000 Skolkovo Foundation grant and have raised as much from investors. Other areas in which researchers in Innovation City are working include the development of speech recognition software, an artificial 3D vision technology, and a nuclear reaction-based battery with a 10-year service life.Thanks to Skolkovo, perhaps the entire world will be using these technologies and devices in the future. Bolshoi was closed for a few days to lay new tracks designed to reduce vibrations that could be felt even inside the concert hall. The revival of a national brand The iconic Bolshoi Theatre re-opened its doors on October 28 with a gala concert. the birth of the Russian lyrical genre. The production will be directed byVladimir Yurovsky and staged by Dmitry Chernyakov. The first ballet of the season,“Sleeping Beauty”,with original choreography by Marius Petipa, revisited by the Bolshoi’s art director, Yuri Grigorovich, will open in November. Later in the season,“The Knight of the Rose” by Richard Strauss and“Charodeika”by Tchaikovsky, will represent the only other new productions of a modest first season. Lovers of contemporary dance can also look forward to the fresh, breathtaking work of choreographer William Forsythe. Russia's historic Bolshoi Theatre reopened on October 28 after six years of elaborate, painstaking reconstruction. Forget stereotypes, discover the real Moscow Image trap "Before coming, I thought Moscow winter would be terribly cold. But when I saw the first snowflake of my life and made my first snowball, I felt very happy. Actually, I like the weather here more than India." Paribhi Sharma, 28, India. "The stereotype is that Moscow is big, crowded, and that people are always in a hurry. These are all true! However, it is possible to find quiet places, and Moscow's parks are wonderful." Andrew Close, 40, UK "Before I visited Moscow, I thought it would be unpleasant and the people would be unfriendly. But I realised that generally, if you need help, people will help you. I can go out alone and don't feel unsafe." Sarah Kay, 22, England. Imagine Moscow and stereotypes start flowing thick and fast. Horribly expensive, anarchic, lawless, it gets dark by noon, melancholic and depressive. And yes, every Russian woman is a potential Miss World. Well, stereotypes sometimes help to conjure up a foreign place, but they are invariably distorting. These stereotypes hark back to the Cold War and the Iron Curtain, when only a few people could afford to see for themselves what things were really like“over there.”Twenty years have passed since the collapse of the Soviet Union, and to quote singer Michael Stipe, it was“the end of the world as we know it.” After talking to many expats, RIBR found that Moscow has a visceral impact. Rarely did we meet someone who is blasé about the place. It punches them in the gut and teases the imagination with its ageless beauty, epiclike grandeur and a largerthan- life feel to its bustling life. To know what foreigners think about Moscow, RIBR interviewed dozens of expats and tourists aged between 22 and 50. Here is what they think. To Russia with love: Indian tourists amid the throng of visitors at the Kremlin in Moscow. India visit. “Top-priority cooperation projects and joint efforts in the programme will involve spheres like economic and trade policy, housing and utilities infrastructure, architecture and real estate development, traffic management, the Safe City program, healthcare, education, culture and tourism,” he said. Among other things, the two countries will continue the practice of holding the Days of Moscow in Delhi and Days of Delhi in Moscow in 2012-2014. “The events will include exhibitions, concerts, and feature documentary films from both countries,” he said. the second most expensive capital in terms of hotel accommodations, after Oslo. However, if one looks at the difference in average prices between Moscow and for example, London, which is the fourth most expensive city, it is less than 4 euros (137 euros). Part of the reason for the high prices is the shortage of hotels in Moscow. There are 215, according to official statistics. Things are looking up though: in 2011, three new hotels were opened in Moscow, four more will open before the year is out and 14 hotels in the center are due to open in 2012. According to City Hall, by 2020, the capital will have 535 hotels capable of accommodating 150,000 tourists. Ask directions from a beauty “As for finding your way around, the metro is really pretty clear and simple. The crowds can be a bit intimidating if you get lost, but if you're underground, you can find your way.Above ground, the streets can be confusing, and they're not always clearly marked,” says Elliott Estebo. Street signage is increasing, and you can always ask directions from a passer-by: the younger the person, the more chance he or she speaks English. And one stereotype is true: there are beautiful women walking around in stylish clothes, just as you might imagine.You can even ask them directions. But an elder Babushka (grandmother) is more likely to take you by the hand and show you your train. And if you try just a few words in Russian, you will be heartily applauded. countries. Markets are the best place to look for that cheap, authentic piece of Russian culture that you just can't live without,” advises Laura Gardner from Manchester, UK. One of the most famous souvenir markets is located at the picturesque Izmailovsky Kremlin. The average prices there are lower than in the shops and, most important, you can bargain. Expats and tourists agree it is a great place to practice your fledgling Russian. Learn to ask “How much?”Then learn to walk away when you hear the answer. The price goes down when they see your back. It works every time. Dangers at every step? According to The Village portal, 15% of expats interviewed are afraid of nationalists — and not without reason.“If you are a minority going to Moscow, don't let the comment I wrote above discourage you. Most Russians I met were very loyal, friendly, and generous. However, there are a few bad apples mixed in as well, and you probably will come across them at some point during your stay,”says Cole Margen of California. Here are some don’ts: do not stray onto unknown streets after dark and keep away from groups of strangers. Official statistics state there were 24 crimes against foreign tourists in Moscow last year. "Someone told me Moscow is a dangerous city. But when I came to live here I realised that it's not as dangerous if you are careful and observe common safety rules.Such as: try to avoid metro in the night, don’t go the darkest area at night and don’t put all your money in the bag," says Neeraj Khemani from India, who has 2,5 years' experience of living in Moscow. Moscow is changing by the minute. It's time to let go of stereotypes, and discover a vibrant, pulsating city that never ceases to amaze with its myriad charms. There is now a round-theclock call center for Englishspeaking tourists in Moscow. Operators are ready to answer all your questions about the capital’s places of interest, transport, or help in an emergency. Telephones: 8-800-220-00-01 and 8-800220-00-02. The call is free.